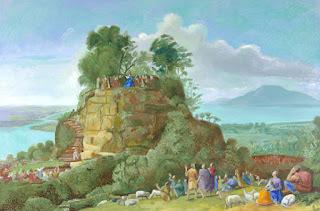 In the final exhibition room at the Bigger Picture exhibition at the Royal Academy there are several versions of Hockney's Sermon on the Mount. He'd got the idea from a painting which he had seen at the Frick collection in New York. 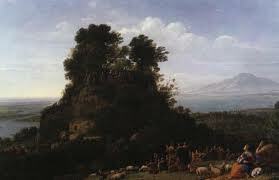 It's by a little known French artist called Claude Lorrain. Commenting on his own version Hockney said that he had been inspired by Claude's use of depth in the picture. Whist most paintings have depth in the centre of the picture, thus drawing the obsever into it, and the near point around the edges, Claude's had reversed that. The near point is the impressive mount from which Christ is depicted as teaching. I guess it's an unintentional comparison, but how true to Christ's teaching. Indeed as Tim Keller puts it, Christ's teaching from the mount is about an 'upside down kingdom'. Christ reverses the world's values, the weak are strong, the hungry are fed and the poor are rich.